Wireframe Modelling - Wireframe modeling is useful for initial design iterations and as reference geometry, a 3D framework for subsequent modeling or modification. Surface Modelling - Surface modeling offers fine control over curved surfaces for precise manipulation and analysis. Solid Modelling - Solid modeling is efficient to use, easy to combine primitives and extruded profiles, and offers mass properties and sectioning capabilities. Note: The WCS icon seen in this diagram is different than yours as the image is from an older AutoCad version. Newer versions use a 3D WCS icon by default. 3. Select the front right corner of the navigation View Cube to get a 3D isometric type view. 4. Copy the bottom part of the cylinder up the correct amount. 7. Move this line up to the height of the center of the circle which is halfway up the height of the cylinder (use Midpoint OSnap). To be able to draw on the plane of these vertical and horizontal lines we need to move the icon to a new location in the next step. Working with 3D objects requires a good ability to move the UCS to where you need it. 11. Copy the line in the center to the top and bottom quadrant of the circle. Note: Your view will look somewhat different as this view is slightly turned. The lines look like they are connecting with the top and bottom of the cylinder circles in this view. You can spin your 3D drawing by Left clicking on the View Cube and then moving around. You should try this out. Right Click (or hit Enter) to select the Current UCS view. Select the top and bottom line as cutting lines. Select the circle to trim. Note: the picture looks like the horizontal part has move upward but if you use the View Cube and spin around you will see that it has moved backwards, not up. 17. You now need to change the UCS back to the World view WCS. Select “Unnamed” under the View Cube and select WCS. If you cannot see the TOP on the View Cube tilt it around. 19. If needed, use the arrows to get the TOP view rotated correctly. 20. Trim the edges by selecting the cylinder circle as the Cutting Edge then the Lines to trim. 23. Select the horizontal lines to be cutting edges and trim the circles A & B as shown in the next step. 25. Then copy the line from B to C.
With Trim select both Line Aand the small Circle B as the cutting edges. Then select the center portion of line A and the B side of the circle to trim them. Right click when finished selecting then right click again to finish the command. When finished Editing the Polyline you should see a dashed line as above if you select anywhere on the polyline. If the whole line is not dashed then there is something wrong with your polyline and it will need fixing. 33. The wireframe model is complete and is now ready to be surfaced in the next section. NOTE: Surftabs set the number of lines that will make up the mesh. It depends on the object what these settings should be – trial and error. 2. Starting with the Cylinder you will need to use RULESURF for the curved wireframe. Repeat the above for the inner circles. NOTE: For a smoother mesh you would need to increase the Surftab settings. 3. To make it easier to work with the wireframe and mesh it is best to move the mesh to one side the same amount each time (so they line up). 5. Move these new meshes to same amount you moved the first set. 6. Using RULESURF you will add the curved end. Select the Path Curve – the small circle at the back (as it is a full circle, unlike the front which is 2 arcs. 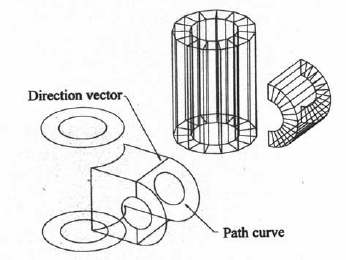 Select the Direction Vector line. NOTE: The polyline D you created earlier was necessary as Edgesurf can only be created between 4 lines. 10. For this next step you will use EDGESURF to fill the 4 lines with a mesh. 14. Use EDGESURF to create the mesh. 15. Copy this mesh down. 17. If you use the HIDE command you will view this as shown, but if you were to print this the hidden lines would still be there. Go to print and select Print Preview to see that the hidden lines are back. You will fix this display setting later on. Changed the viewport so it only fills half the titleblock – grab the grips and move them to fill half. Copy this Viewport to the other half of the title block. Use the ViewCube to get 2 views of the Column, as shown. Select the Properties arrow to open the Properties dialogue box. NOTE: Try some of the other options to see what they do, but depending on the settings – object colour or materials it may not look very good.